OSCAR uses ultrasound to rapidly heat up the cement used in cemented arthroplasty allowing ease of removal of PMMA without compromising bone stock. Cement removal technique is extremely rapid and can normally be accomplished in 25 minutes or less. PMMA bone cement responds instantly to a vibrating wave-guide. 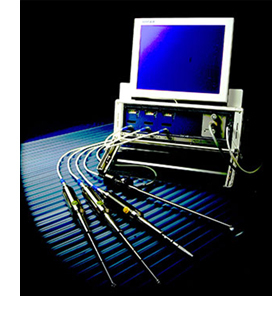 The risk of bone perforation or fracture is negligible when OSCAR is used, as the probes are designed to emit a characteristic sound the moment they come into contact with the bone surface. The equipment is simple to operate, and both efficient and predictable in its performance. It has been designed with surgeons, scrub nurses, technicians and hospital engineers in mind and it use permits the accurate scheduling of operating lists. The generator which is mains powered and completely portable is made up of five modules. There is an input power module running three identical modules each driving a handset with a cement removal or prosthesis extraction probe attached and also running a fourth module which powers the endoscopic light source and camera. All cement removal probes are designed to perform a different function: grooving, scraping or piercing or extraction. Probes come in sizes ranging from 6-13mm. Latest camera technology provides complete visualisation of the canal.